Easterseals is “steeling” the hearts of the community with its Oh no! 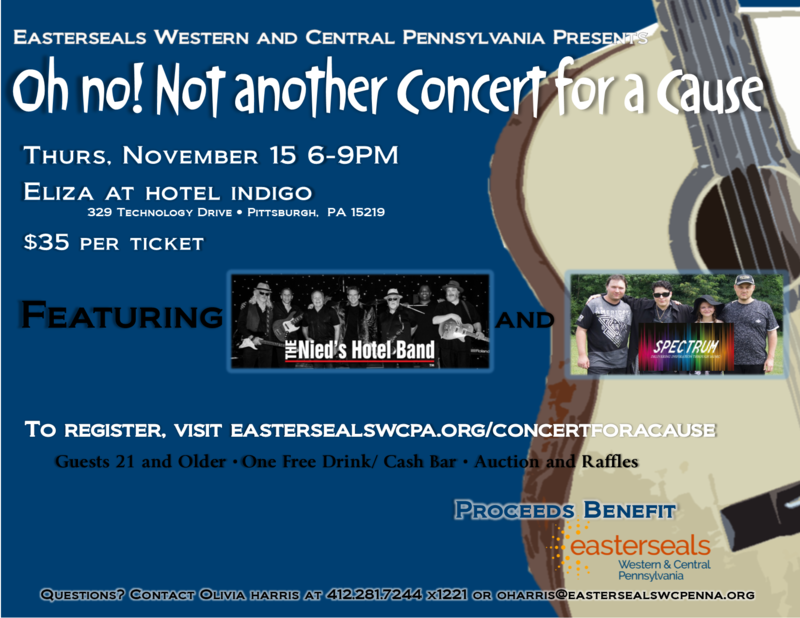 Not Another Concert for a Cause, featuring the Nied’s Hotel Band and Spectrum, a band fully comprised of musicians on the Autism Spectrum. Watch as these Pittsburgh-native bands take on disability and rock the night away at Eliza- A Hot Metal Bistro at the Hotel Indigo by the Pittsburgh Technology Center on Thursday, November 15 from 6-9PM. Doors open at 5PM. Tickets cost $35 and includes admission to the concert and one free "Indigo Blues" drink. There will be auctions and raffles. All proceeds will benefit those with disabilities and other special needs. Click here to register.